So as the times are what they are and I am confident in my skills in the kitchen I decided to offer my services for money. 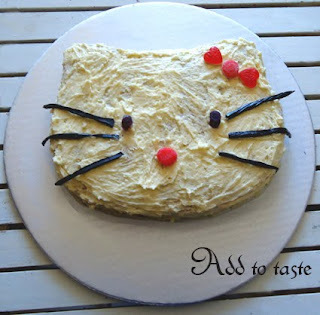 Luckily some one responded :) I was asked if I could do a "Hello Kitty" cake. I said I could try and this wonderful person offered to pay full price for both the trail AND if she likes it the real deal. I looked around for a good recipe for the sponge and decided on a hot milk and oil sponge my good friend browniegirl posted a while back. You can find the recipe here (minus the orange zest) and you can find browniegirl in her new home here. Not only does she make the most delicious looking food, she helped me a lot yesterday with cutting the cake in half without making an oopsie. 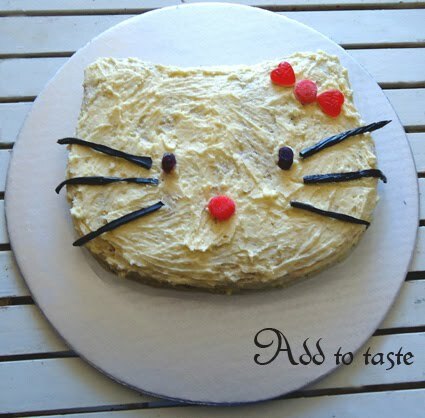 The good news is, with only a few changes (jelly beans for eyes, pink icing, diffrent icing recipe), I am making the cake again!! Thank you browniegirl for the recipe and the cake and my good friend Cricket for ordering the cake.